Christmas traditions and memories have such a special place in our heart each year. My husband had a great-aunt that lovingly and painstakingly crocheted beautiful angels and snowflakes that we use every year on our tree. 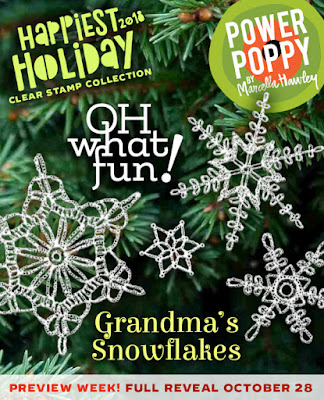 They are a lovely heirloom item, so today’s new set from Power Poppy called Grandma’s Snowflakes is such a treasure! Here’s what Marcy had to say about this special set: "A snowflake set like no other - this one is all based on designs for vintage crocheted snowflakes, the ones like my grandma (and so many others) used to make. As a matter of fact, they are coming back in style with the hipster knitting-and-crocheting scene. So why not stamp a few of 'em? I've got several large sentiments that focus on the love of home and happy memories. It took me about a billion hours to draw this set.... I think I was in a trance by the end of it." The set is a gorgeous 6 x 6” size, and there are so many unique snowflakes and sentiments included! I started with a frosty watercolour wash in the background to give the look of a frosty window with pretty snowflakes attached to it. 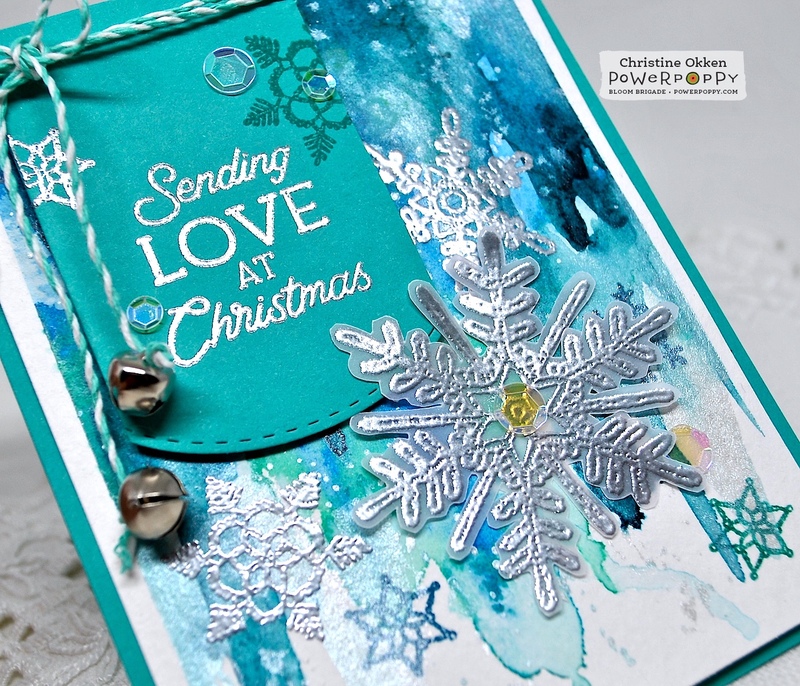 I used cool shades and allowed the pigment to drip down the page, and also added some washes of metallic silver watercolour as well (Gansai Tambi) I embossed and stamped several layers of snowflakes, including the largest one on vellum. A few silver Christmas jingle bells, iridescent sequins and some baker’s twine add to that frosty look! What a wonderful background for these unique snowflakes! 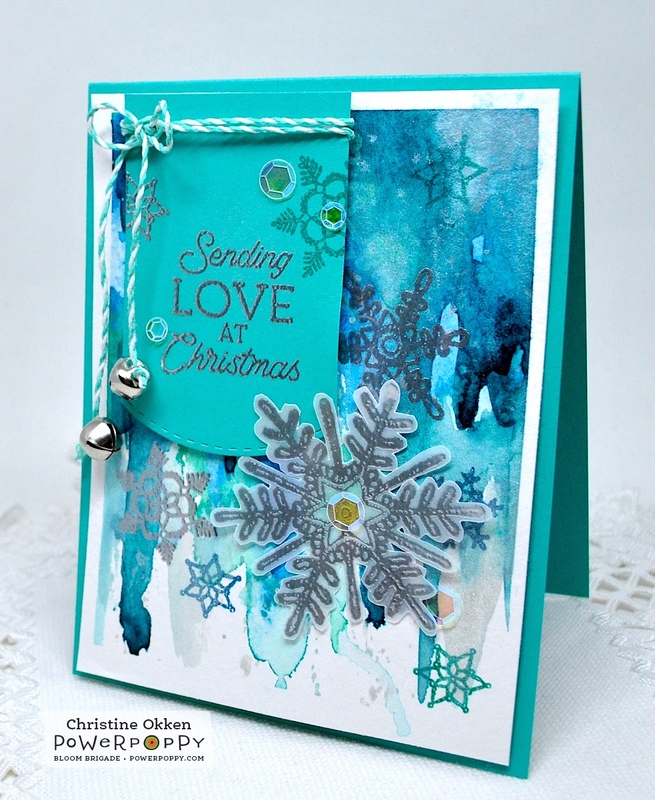 Well, I've already decided I love the snowflakes... but your watercolor background -- wow! Your background is simply stunning! I truly feel like I'm looking out the window on a frozen winters day while snowflakes swirl around outside! Very pretty. This background looks so cool and creative job.